Welcome to Music Friday when we bring you great, new songs with jewelry, gemstones or precious metals in the title or lyrics. 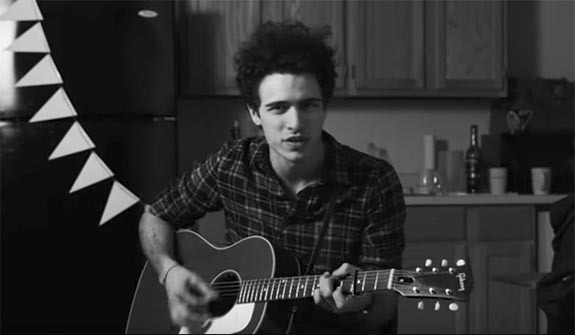 Today, singer-songwriter Marc Scibilia celebrates the season of sun, surf and wanderlust in a catchy tune that inspires us to "sparkle just like diamonds." TV watchers will recognize "On the Way" from the newest Jeep commercial. The 30-second spot, which is called “Summer of Jeep: On The Way," has accumulated 2,300 national airings and has been viewed on YouTube.com nearly two million times since it was posted about 10 weeks ago. It features great-looking millennial Jeep owners enjoying a perfect day at the beach. Shazam the song and you'll learn that Scibilia also released a full length-version. Scibilia repeats the hook, "Let your summer guide you, on the way, on the way," while encouraging the listener to be fearless when discovering new roads. In the first line of the song, he introduces precious stones to help make his point. He sings, "Journey where this path may lead / And live as big as giants / Summer sun and feeling free / Sparkle just like diamonds." Born in Buffalo, N.Y., to a musical family, Scibilia moved to Nashville to become a songwriter just a month after graduating high school. According to his official bio, the young Scibilia got the idea to head south from a sarcastic guidance counselor who was frustrated with Scibilia's reluctance to pursue a "conventional" career path. “What are you going to do? Go to Nashville and write songs?” she taunted. To the young musician, this was a great idea. Scibilia flourished in Nashville and took in all that it had to offer. He experimented with every genre of music, writing songs for other artists and touring as the opening act for James Bay and the Zac Brown Band, among others. In 2010, Scibilia landed a publishing deal with Sony/ATV. The artist got a big break when his cover of the Woody Guthrie song “This Land Is Your Land,” appeared in Jeep’s “Beautiful Lands” Super Bowl commercial — the most Shazam-ed commercial of Super Bowl 2015. Once again, Scibilia's "On the Way" has been catapulted by the popularity of a Jeep commercial. Written and performed by Marc Scibilia. 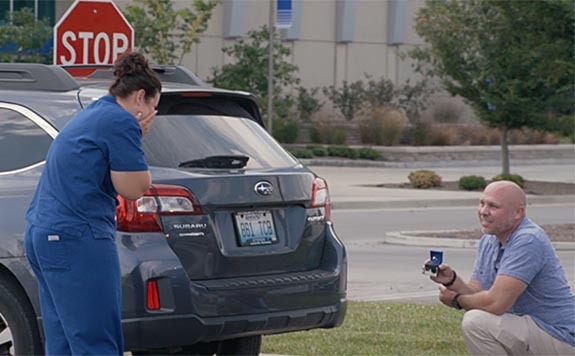 A retired law-enforcement officer who was dragged nearly 20 feet and run over while attempting an arrest 13 months ago is now the happiest guy in Lexington, Ky., after his girlfriend said "Yes" to an unusual traffic-stop marriage proposal. 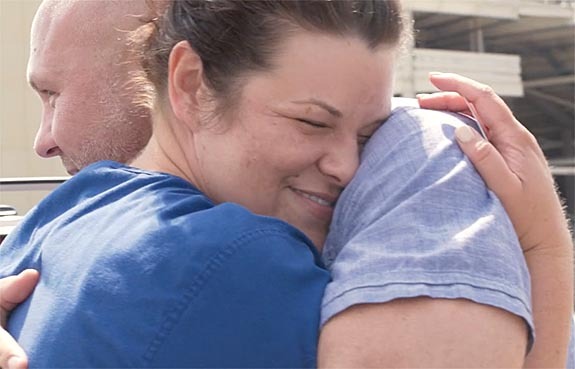 Shepherdsville Police Officer Rocco Besednjak, who was forced to retired due to the seriousness of his injuries, recruited the University of Kentucky Police to assist with his romantic, but mischievous, scheme to surprise Lauren Vincent, who is a nurse manager for the pediatric forensics unit at UK Children’s Hospital. Because Vincent, 36, works for the University of Kentucky, Besednjak wanted the proposal to tie into the school. On Thursday, August 10, Vincent and her supervisor, Dr. Christina Howard, who was in on Besednjak's scheme, took a drive to pick up a donation for the hospital. 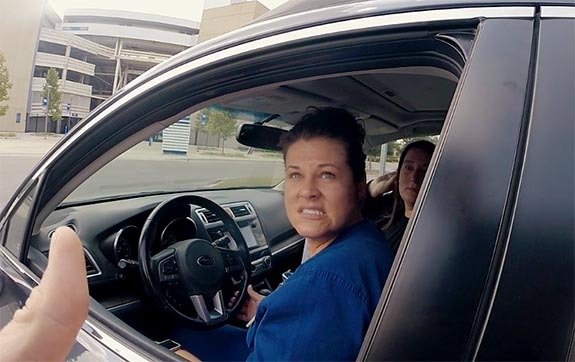 During the trip, which passed in front of UK's Kroger Field, Vincent was pulled over by a University of Kentucky officer. The officer told Vincent that she had something dragging from the back of the car and that she needed to get out and take a look. 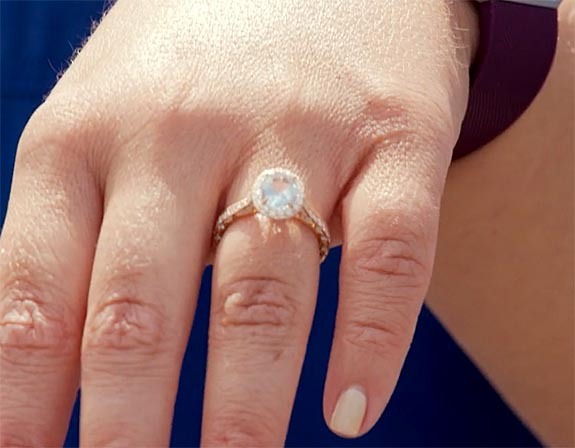 When she circled to the back of the car, Besednjak, 38, who had been hiding in the passenger seat of the officer's car, was already down on one knee with a ring box in his hand. Vincent was startled for two reasons. 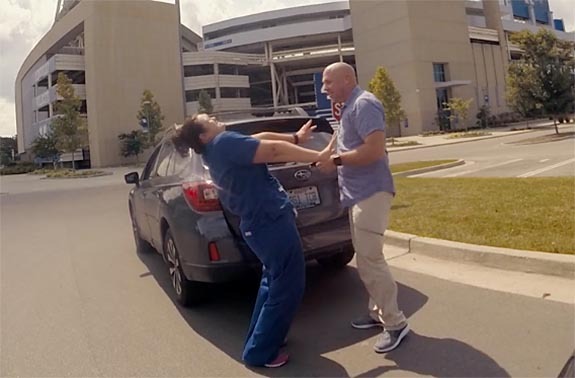 Certainly, the marriage proposal during a traffic stop was surprising enough, but the nurse also couldn't believe her boyfriend was kneeling on his damaged leg only one week removed from spinal decompression surgery. On July 3, 2016, Besednjak nearly lost his life while attempting to arrest a suspect at a gas station. The woman had an outstanding warrant, but instead of surrendering, she rammed Besednjak with her car and dragged him nearly 20 feet. His leg was run over during the tragic incident. The perpetrator received a 40-year sentence in May. Now in the shadow of Kroger Field, Besednjak was ready with a diamond ring and a proposal for the love of his life. "You know you make every day happy. You make my life the happiest it could have ever been," he said. "I hope you're not too embarrassed, but I love you a lot and I want you to marry me." Before she answered, the healthcare professional had to admonish him. "I love you," she said, "but why are you on your knees? "So, are you going to marry me?" he interrupted. "Yes," she screamed, adding, “Why are you on your knee? You’re not supposed to be on your knee. I love you." The couple embraced and then Besednjak handed Vincent the halo-style, yellow-gold ring to place on her own finger. Vincent giggled with excitement, bending backward while viewing her new ring with her arms extended to the front. Unable to stay in the romantic moment, Vincent returned to the theme of Besednjak needing to take better care of himself. "I was worried about why you were on your knee when you had surgery last week," she admonished. "That's what I'm supposed to do," he said. 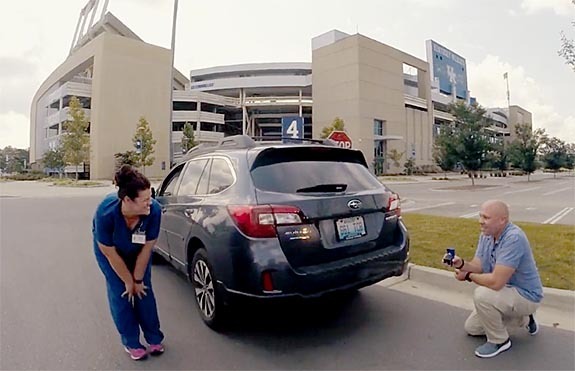 The proposal was captured from three camera angles — one shot by a videographer, one from the officer's body cam and one from a camera mounted in the ring box. See the video below. Rocco Besednjak Proposal from Antonio Pantoja on Vimeo. Credits: Screen captures via Vimeo.com.